Fuji Neopan is better than Kodak Tri X! Really? You know how it is; you sit down with a couple of like-minded friends and hey! presto, the conversation veers towards which camera or which film is better, etc etc. The best method of tackling this, in my opinion, is, just laugh. That’s right, just listen and laugh. I have found this works every single time, and if they ask you what you think and you don’t want to be drawn into the melee, I just say, “..well….” and leave it at that. They soon move onto something or someone else! That’s what happened last night, when I had a few good friends around for a chat and drinks. Nothing aggressive, mind you, but certainly subjects discussed very passionately. There was chap there who started it all off by mentioning the merits of Tri X, which we’ve talked about here before. Then another guy went on to say that Fuji Neopan was better than any film ever invented, and that was like a red rag to a bull, and off the subject went! Some said Neopan is so versatile, you can use it for fine art, wildlife, portraiture or whatever else, and it will come out with exceptional results. Another guy said Neopan has the truest blacks he’s seen in any film; pure, deep blacks, not just dark “greyee” blacks as with many films. But then I mentioned that Tri X also has very deep blacks, but that did nothing to assuage the flow of the discussion. Then the talk shifted to that holy grail of film users — grain. Almost overwhelmingly, everyone in that room said that Neopan has very little if any grain to be seen; especially in medium format guise. Yet another guy said that Neopan has been a real under-rated film; he is a seasoned photographer and has tried every film ever made on this Earth of ours but has come to the conclusion that this one has everything — the right speed, the right range of tones and the right amount of grain. I had to add my 2 cents worth by saying that it all depends on how and what developer you use; throw Neopan in any old developer, without taking care to check temperatures and timing etc, and there’s no way you’ll get good results. I have always used Rodinal, at the right recommended temperature, developed for a precise amount of minutes, and only then have the results been as good as these guys were saying. 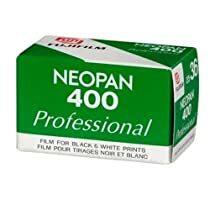 So what is my opinion of Neopan? Well, as I have said before, it is all subjective; I may value a film or a camera very highly, whereas another person may think my choice is not worth a penny! Bearing that in mind, Neopan is a very good film. I agree it delivers very good tonal range indeed; deep blacks and contrasty whites, no wishy-washy stuff here. Grain is virtually non-existent, providing of course that we develop it correctly. Anything more and I would recommend you try it and see; that would be the final test! This entry was posted in black & white photography, cellphone art photograhy, chemicals & film, Classic film cameras, digital cameras/accessories and tagged 120, 35mm, blacks, developer, film, fine art, fuji, grain, medium format, monochrome, neopan, portraiture, rodinal, temperature, tri-x, versatile, whites, wildilfe. Bookmark the permalink.